Find Better Ideas, Faster ® with a custom hotel amenity trend report, our PRO Dashboard and 80+ categories of premium trend reports. The Hotel Amenity Trend Report allows readers to become acquainted with the luxurious offerings provided by travel lodges and housing accommodations. This report not only investigates the use of amenities within hotels but also expands on the amenities like temporary residence rentals and hostels. 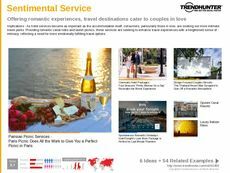 This report looks at locations, consumer desires, products and packages that are provided by institutions who are looking to create a memorable experience for guests. This report is ideal for travel agents and hospitality industry professionals that create unique experiences and provide amenities to consumers. The report investigates spas, gyms, wellness packages and other items that are typically offered to guests at hotels -- benefiting readers who work in the health, wellness and personal care sectors. 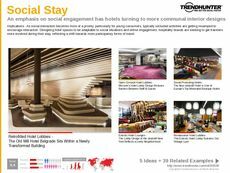 The Hotel Amenity Trend Report will help you better understand the consumer, the products and which amenities are suitable for your specific brand and target audience.